For Cisco Telepresence SX20, SX80 or C-Series codecs; compatible with RoboSHOT 12 and 30 HDBT, RoboSHOT 20 UHD, and DocCAM 20 HDBT. Get more from your codec. 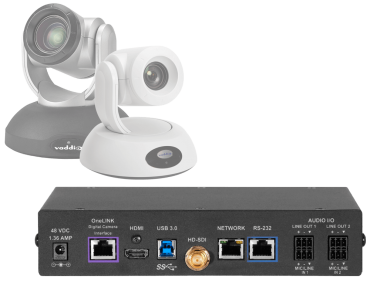 With Vaddio's OneLINK Bridge Codec Kits, you can bridge traditional videoconferencing equipment into USB-based conferencing applications such as Skype for Business, Google Hangouts, or Zoom. Sounds complicated - but it's not. Tailored for Cisco codec systems and compatible with RoboSHOT 12 and 30 HDBT, RoboSHOT 20 UHD, and DocCAM 20 HDBT cameras, this OneLINK Bridge kit simplifies installation by extending power, video and control to your camera over a single Cat-5e cable up to 328 ft (100 m).